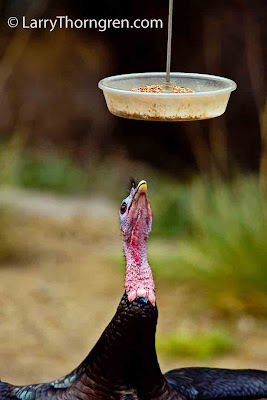 This Wild Turkey looks perplexed as to how to stretch tall enough to eat out of the feeder. It showed some intelligence however and jumped up and delivered a hard blow with its' beak at the bottom of the feeder, which spilled lots of seeds onto the ground. We often assume that birds are stupid because they have a small brain compared to ours. I like to think of their brain size as a natural minituration, similar to the way we are designing computers today. In many ways they are as intelligent as humans. This bird was on the grounds of a lodge in Madera Canyon, Arizona. Microprocessors - I like it! This Wild Turkey looks really cute for me.I like this nice post.I don't think so that birds are stupid.Thanks for showing this picture. White Wolf Howling - Get This Collar Off Of Me!